Maintaining our 19 year-old Toyota Hiace campervan is a challenge. Replacement accessories are always hard to find and are often the expense on an old vehicle cannot be justified. On our recent trip to North Qld from home in Melbourne it became obvious the fridge needed replacement. After googling many campervan conversion businesses without success we came across Southern Spirit Campervans. No one could have been more helpful. We arranged to call in at Geebung on our way home. Pia and Ollie suggested using a used Engel fridge they had in store from an earlier campervan upgrade. It was the latest model, only 4 years old and in good working order. On arrival at the factory Ollie gave the job his immediate attention. Pia had ordered a Waeco fridge to be delivered the next day in case the Engel would not fit in the space available. Ollie soon discovered the Engel was larger than the old one but came up with some adjustments to the cupboard, a perfect solution at half the cost. We were much impressed with their concern to solve our rather minor issues and their efforts to get us on the road again without delay. For them no job is too small or too large. Thank you very much Pia & Ollie. I had already been around Australia in a Toyota Hiace camper (my beloved Moby) and now wanted to do it again but this time in a 4x4. My choice was a mid wheel base 4x4 Sprinter which I had to wait 5 months for to arrive from Germany. In the meantime I started to look around for somebody to do the camper conversion. When I spoke to Pia from Southern Spirit, she was the first person who sounded competent and really wanted to help. Other companies just quoted for what I asked for, happy to just take my money, where as Pia thankfully advised me on a few things and convinced me to make a few minor changes to my grand plans! Although, I’m sure Pia and Oli would have figured out a way put a heli-pad and spa bath in it if I wanted them to! I must admit, I was still nervous about handing over a brand new vehicle to Southern Spirit but my fears quickly faded as work began. The level of innovation and skill was amazing and Pia and Oli seemed to be able to make any of my weird requests happen. The end result has far exceeded my expectations. I now have a real head turner that is also functional and the workmanship is amazing. A lot of thought and innovation went into every addition. eg. Pia and Oli changed our outdoor shower placement because they thought the tap would be too high for us where I had originally requested it. Oli also put a lot of thought into cupboard heights and widths so we wouldn’t bump our heads and USB charging points and 12V points were placed around to make our life easy. Oli went to a lot of trouble to install an outside light. Due to the van being only mid wheel base, there wasn’t really anywhere suitable to put it without it being covered by the sliding door if it was open. The solution...put it in the sliding door itself (harder than it sounds). There was even a little hole cut out in the shelf that holds my water filter so that we can put a cup under the spout it to pour the water into. I also really love the colour scheme Pia suggested. I was brave with my choices and the end result was much better than expected. 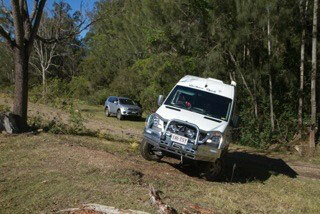 Its not all about looks though, and I have since taken Moby II on a 4x4 training course to put it through its paces. There was not one noise or rattle and Moby II made it through still very much intact. I could go on raving all day about how happy I am with the end result. I can’t recommend Southern Spirit Campervans enough! Thanks Pia and Oli. I am one very happy camper! I spent quite a while researching where to take my new Toyota Hiace to be converted into a camper. I had a good idea how I wanted it fitted out, but didn't get a very positive response from the places I contacted. That was until I found Olli and Pia at Southern Spirit Campervans. Their professional knowledge of the industry, and skills in creating what you want into a reality, has given me a truly individual van conversion that is not only stylish, but practical and top quality too. Pia's design, choice of product and colour scheme was outstanding. Like she read my mind of what I wanted! Olli's workmanship is very precise and clean. Everyone who sees my van remarks on how neat it looks. I had a vision of what my dream campervan would be like and I really appreciate the time and effort taken to make it come true. Not an easy job either when the dream is to have an easy pull out double bed, full kitchen, heaps of storage (including room for two guitars! ), toilet and shower facility (with hot water), and legal seating for 4 passengers. All in a Toyota Hiace!!! Most people said it wouldn't be possible, but Pia and Olli took up the challenge in such a positive way there was never any doubt in my mind that the outcome was going to be anything other than amazing.......and I was right! I'm more than happy to recommend Southern Spirit Campervans to anyone who is looking for a conversion company who will make your home on wheels a delight to live in. Life is a Road Trip.............enjoy. 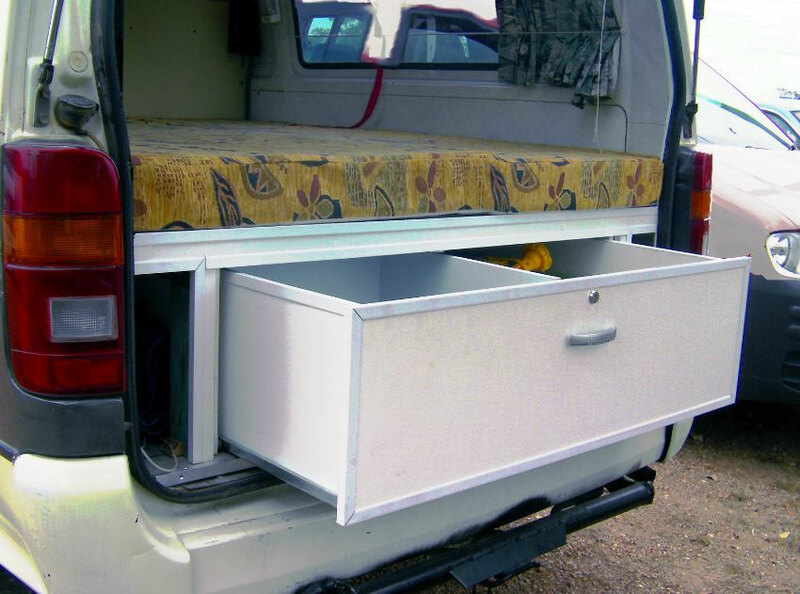 “I live in North Queensland and have a VW Maxi Caddy and was keen to get it professionally outfitted so that I could use it as a campervan, carry large items and also use it as my day to day vehicle but there are no outfitters in the area I live. I found the Southern Spirit website and made contact with Pia and a meeting was arranged. I flew down to Brisbane for the day and from this a layout plan was done with choices of material to be used and date set for the work. The vehicle was delivered the week before Christmas and hey presto....Santa gave me a campervan for Christmas! I picked the vehicle up, loaded my supplies and headed off to Victoria the next day. It was fantastic having the rear fitted out as I could pull up anywhere...eat, sleep or just chill for an hour or so. Pia and Ollie were full of ideas for my little van and not confined to the standard layouts and most importantly worked with my ‘wants’ and also my budget. The cabinetry workmanship is excellent and the van was ready on the date arranged. While travelling down south it was discovered the water tap was faulty and after contacting Pia a new tap was installed when I got back to Brisbane without any problems. 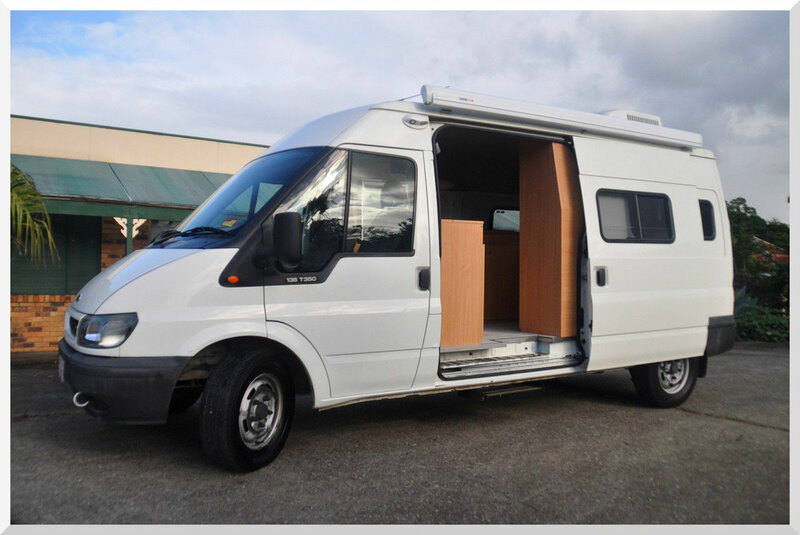 I have no hesitation recommending Southern Spirit Campervans to anyone wanting to outfit a van and I know for sure I will be using them again for any updates to my van. I bought an old Toyota Hiace Pop top late in 2011, and jumped into the purchase out of excitement, instead of doing my research. I took the van to Southern Spirit Campers to have some conversion work done in the back, and subsequently found out a lot more work was needed to get that van to a safe and roadworthy state. The workmanship and service I received from Olli and Pia was outstanding. The conversion work in the rear, from old fold down benches and table, into a full double bed with huge storage drawer underneath, is excellent. It looks good, is very functional and was very reasonably priced. These guys also went over the van interior with a fine tooth comb and fixed up any small bits and pieces that were old or broken or needing an update. They also sourced and fitted an excellent side awning and a solar panel system, both at very reasonable prices. Further investigation into some leaks in the pop top found that the rim of the van was very rusted and damaged from previous bad repair jobs. Olli worked night and day to solve this dangerous issue. The work he completed was top quality and I now feel that I am driving a van that is not only fun and functional to camp in, but also safe!! Most important for me and my two-year-old daughter. Southern Spirit Campers do excellent and thorough work, they are well connected to others in the industry, so can source well priced accessories and parts, and they are great people too. I have no hesitation in recommending them to anyone with a van or camper needing some work or modifications. We contacted Southern Spirit Camper Vans as we wanted “our style” of Camper van not an “off the shelf” model. Both Pia & Oli were very understanding & would do whatever we wanted building to our design. After some discussion a design was arrived at, but one problem was that we had no Van, we knew what we wanted but were unable to find it. Pia said “no problem we will find a Van for you” & she did exactly that, she found the model we wanted at a bargain price. A Ford Transit 2004 mid roof LWB with 140000km. Our only problem was that we did not get a high roof model ( Pia highly recommended a high roof), we are both tall people. So we’ve made a few modifications to make our Van more comfortable, for us. We had a choice of materials, colors and different layout ideas. We asked for “no rattles” and we got it! Oli does a great job, he’s very meticulous, the flooring was level within a millimeter, there are no gaps, furniture is fitted perfectly, etc.etc. We are very happy with our little camper & have already done a few trips on our plan to go around Australia. 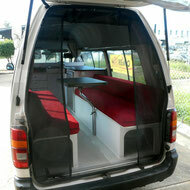 We highly recommend Southern Spirit Campervans as the place to have your Van built or converted. Cheers from the grey nomads. Our great family RV was not suitable for us anymore. Our kids are old enough planning their own holidays. So we decided to get the bunk bed out and getting a permanent double bed fitted. The Southern Spirit Team did a awesome piece of craftsmen work. It looks like the bed was always there and we got extra storage space as a bonus underneath. Fantastic! For our working holiday year in Australia we bought a Mazda 8 seater E1800. The guys from Southern Spirit made a real Backpacker out of her. Heaps of storage, a double bed and a rear kitchen. We had a great time and the best was, we sold "Perly" for more as we spend on her.